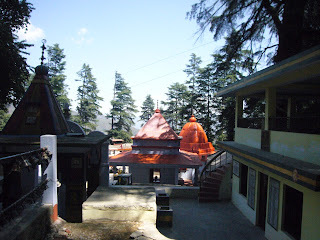 Hat Kalika temple is situated amidst deodar forests, the Janhavi Naula (a covered spring) and temple complex. Twice a year in Chaitra and Ashuj on the eight day of the Navratras, a large fair is held at the Kalika temple. The temple is, however, more remarkable for the grove of noble deodars within which it stands. Close by. To the south-west are the remains of a few old temples and a masonry well bearing, an inscription apparently of some age.